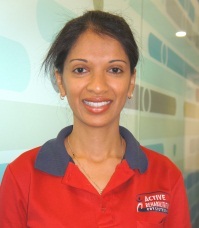 Dipthi is an Outpatients Physiotherapist with significant experience across numerous areas of physiotherapy practice. She has been a member of the Active team for over 10 years and in that time, has worked in all of our hospital and outpatient practices. Her broad experience and expertise have contributed to the compassion and wisdom with which she approaches her patient care. Dipthi works in the areas of musculoskeletal physiotherapy, orthopaedics, acute medical, surgical pre- and post-operative management, neurology and women’s health. She is also a member of our Mars Clinic team, with a keen interest and a supportive approach to Children’s Continence issues. Dipthi graduated with a Bachelor of Physiotherapy from the University of Otago. She is also a qualified and practicing Pharmacist, holding a Bachelor of Pharmacy from the University of Queensland. Dipthi enjoys the balance that she achieves working professionally in both her Physiotherapy and Pharmacy roles. Dipthi has previous experience working with a range of sporting teams including swimming, basketball, rugby and tennis teams.